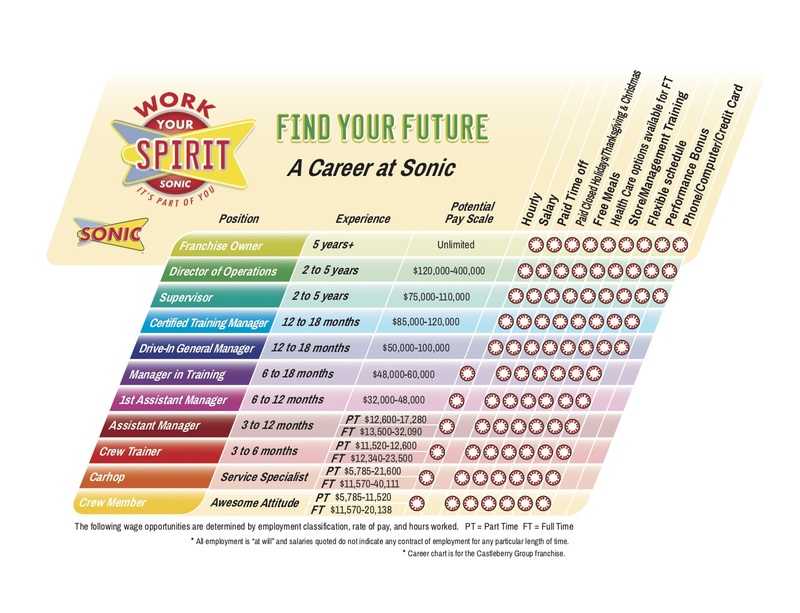 Find your future at Sonic with competitive pay and benefits plus, – and this is a no brainer – free Sonic-Drive In Meals! 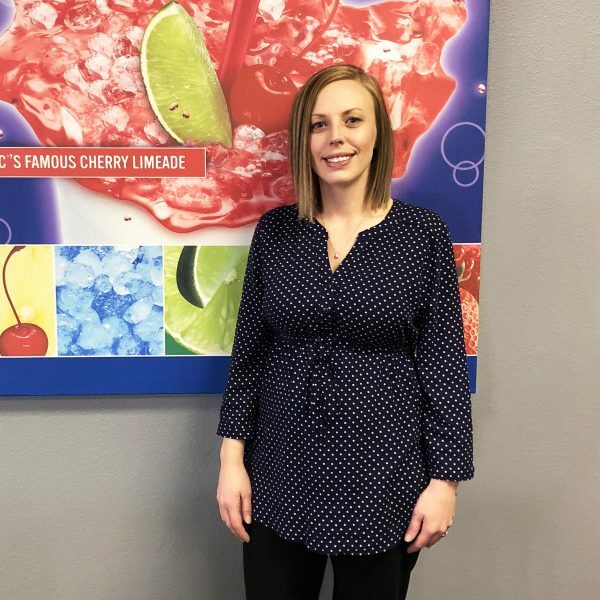 Lauren McNeese is our General Manager of the Sonic Drive-In located at 4320 W 45th Street in Amarillo, Texas. Lauren is from the area and graduated high school from Vega, Texas. She has been with the Castleberry Group since 2009. Lauren went to Amarillo College and graduated from the vocational nursing program. She began studies at West Texas A&M University for nursing when she was hired on at our Washington Street Sonic location in Amarillo. During the summer of 2009, Lauren worked her way up in the store becoming an Assistant Manager. At that point, she decided she enjoyed working with the management team for Sonic and changed her career path to focus on training to become a General Manager. She says she likes the fast pace of Sonic, working with the numbers, and most importantly building a good team of people. She feels she is part of the Sonic family and embraces the challenge of managing her own store. Lauren has been a General Manager for three years now. Her store is seeing positive sales growth and she is proud of her current team of employees. She says they are very energetic, friendly and outgoing. Her team likes to get to know the customers on a first name basis and helps to create a positive atmosphere to be a part of. Her store creates another Sonic family feel, as Lauren is a mentor to her employees. She wants to be a support for them, whether their job with Sonic is short term during high school or college or if they are individuals who come in and find they want to pursue a career. She wants to be a part of that journey and help her employees achieve their goals. Lauren also takes pride in being a part of the Amarillo community. She feels that the Castleberry Group gives back to the schools and local charitable organizations and she enjoys helping in those areas whenever and however she can. During her time off, Lauren enjoys reading, baking and gardening. She loves to be outside whenever she can, participates in tennis, and watches as many football games as possible. Lauren and her fiancé, Tony, are expecting their first child in May this year. Lauren is a valued member of the Castleberry Group and we have enjoyed watching her success. Rhett Garvin is our Owner/Operator of the Sonic Drive-In located in Childress, Texas. Rhett graduated from Lander University in 2004 with a Dual Degree: Bachelor’s in Marketing/Management and a Bachelor’s in Finance. He has been with the Castleberry Group since November 2013. Rhett’s background is in the retail business. He worked at Walmart for 12 years before he joined the Sonic team. He moved numerous times during his time with Walmart, starting off as an hourly employee during Christmas while going to college. He then worked his way up until he became a part of the regional team for their Inventory Management System. He became a trainer, teaching other store managers how to operate the systems and make a profit. With Rhett’s experience in management, inventory and training, his transition into the Sonic operations was positive. Rhett began his time with Sonic in Mangum, Oklahoma. He worked into the General Manager position and stayed at that location for 18 months. He then relocated to our store in Stillwater, Oklahoma on 6th street, managing that store for 14 months. 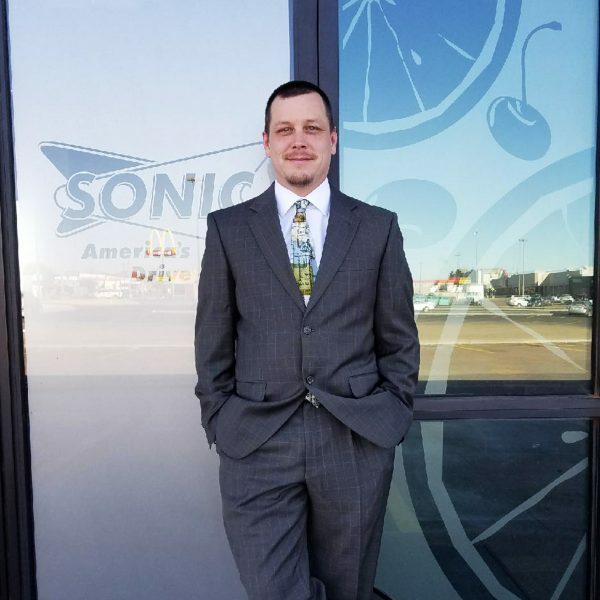 At both Sonic locations, Rhett demonstrated strong leadership skills and the ability to run a sound store with operational expertise with increased sales and profitability. Rhett has always been a high achiever and loves a challenge. When the opportunity for Childress, Texas was presented, he made the decision to take on the chance to grow with the company as a Managing Partner by rebuilding the business in Childress. He has been in Childress for 13 months now and recently opened the new store after tearing down the existing building. His wife, Kimberly of 16 years also works for the Castleberry Group as an Assistant Manager for Childress. The store is on the rise showing significant sales increases and increased traffic. He and the Sonic team are looking forward to a successful 2018. Rhett has two sons and three daughters; Haddon is 17, Bryson 16, Emily-Grace 13, Kalynn 11, and Olivia who is 10. His son Bryson also works at the Childress Sonic Drive-In. Rhett loves the Lord, reads the Bible daily, and watches all sports as often as he can. We are proud to have Rhett as a member of the Castleberry Group. 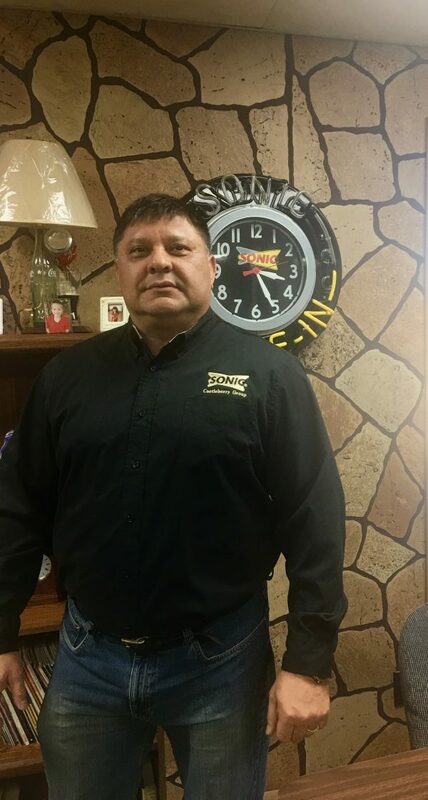 Dean Leal is one of our owners and a Supervisor for western Oklahoma. Dean worked in the oil and gas industry prior to working for Sonic. Dean’s father-in-law, franchisee, David Castleberry had mentioned that he was needing some managers in the Oklahoma market. Dean was interested, he had never managed and supervised a group of employees but was willing to learn and felt he would have a great mentor with David Castelberry. He began his Sonic journey in Clinton, Oklahoma as Co-Manager in January of 1985. He and his wife, Linda, were sent to Sonic Management School and after that training Dean became the General Manager. He was later transferred to the Sayre, Oklahoma Sonic. In 1986, Dean moved to the Elk City Sonic location where he trained for the new store and was sold stock in the Elk City location. He managed that store for 10 years and was then promoted to Supervising Partner over the Western Oklahoma Sonics. Dean loves working with his group of managers and feels like they are part of his family. In fact, that is what he loves the best about working for the Castleberry Group is the close family values it has with all of the management teams both in Oklahoma and Texas. Dean is part of a solid foundation of the Castleberry Group in Oklahoma and brings 33 years of experience to our team. Dean has been recognized as Turn Around Supervisor of the year for the Castleberry Group and actually managed the first store in our group to run $1 million in sales. Dean’s favorite menu item is the Super Sonic Double Cheeseburger with jalapeños and the chili cheese tator tots come in for a close second. His hobbies are spending time with his family, road trips on his Harley, gardening and making his delicious homade candy that he enjoys sharing with his managers. Dean has been married to his wife, Linda, for 32 years. They have two children, Dava and David Jr. and five grandchildren, Kadin, Kylie, Brock, Heidi and Maddi Kay. We are looking for professional, highly motivated individuals who are interested in joining a goal-oriented company with extremely high standards. We offer career opportunities at all levels of management.